Martin Saint (far right) teaches teaches a group of students about blockchain, Bitcoin, and cryptocurrencies. Blockchain technologies have been touted by many as a huge advancement in trust – something that can create trust where it didn't exist before. That's exactly why Carnegie Mellon made sure it would be the first to offer a university-level course on it in Africa. "Trust is an issue throughout Africa," says CMU-Africa professor Martin Saint, who teaches the course on blockchain, Bitcoin, and cryptocurrencies. Saint explains that there is a need for financial inclusion in Africa and that blockchain technologies can help create trusted and efficient digital platforms. "A large fraction of the African population don't have access to banks or traditional financial services," he says. "If we can build a more efficient platform that involves digital currencies that can run on mobile phones, then we really have the ability to connect a lot of people in Africa to financial services, and that's never been possible without a bank or mobile telco before." There are also other applications, Saint says, such as voting platforms, that help to promote transparency, fight corruption, and improve on manual record-keeping. "There's a need for bringing a kind of transparent trust that people really can believe in to Africa," he says. Saint began teaching the course in the Spring of 2017 and recently finished teaching its second occurrence in the Spring of 2018. In the introductory course, he teaches a high-level overview of the underlying cryptography, the blockchain network, how it works and how it can be applied, and the regulatory and legal environment. Since it's a "mini" course, the course only lasts roughly a month and a half, though Saint says that may change in the future. "At the end of the mini, students are typically like, 'Okay, we're just starting to get this! I wish this were a whole semester,'" he says. There&apos;s a need for bringing a kind of transparent trust that people really can believe in to Africa. One of the projects his students were involved in during his class dealt with modernizing the community system used in Africa called "Savings and Credit Cooperatives" or SACCOs, in which a group of people pool their money together, and individuals can take out loans. Members of the group have to meet face-to-face and keep records manually. "The students said, what if we were able to put something like this on the blockchain and have people believe in it and be able to expand the base of contributors and borrowers?" Saint says. "These students have since graduated, but they have been talking with me recently about moving forward and trying to commercialize their technology." Approximately 25 students have taken the course over the past two years, and there are many examples of the students applying their knowledge post-graduation. Bobson Rugambwa, for example, is a former student of his course and recently won $10,000 in seed funding at the Tigo Changemakers competition for his payments and remittance startup. Andrew Kinai is now a software engineer at IBM Research Labs in Nairobi, working on blockchain projects related to payment platforms for financial inclusion. 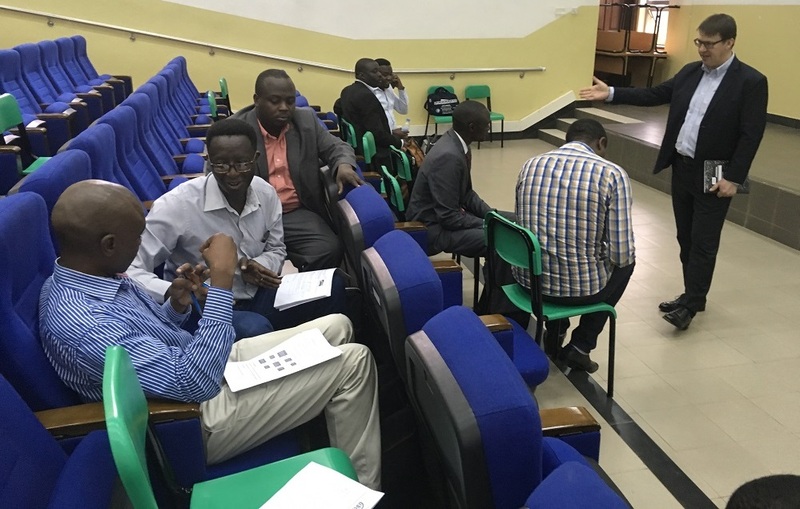 Another former student, Fiacre Mushimire, is the Emerging Communications Technologies Analyst at the Rwanda Utilities Regulatory Agency where he is working on building a "regulatory sandbox" for companies that are interested in coming to Rwanda and piloting blockchain-based platforms. "I also have a couple of former students – Innocent Rugage and Emmanuel Ngirinshuti – who are working at Bank National Rwanda, which is the equivalent of the US Federal Reserve Bank, working on building a regulatory sandbox for things like blockchain-based payment platforms." Saint says it's hugely gratifying seeing his students going out into the African continent and making a difference. "It's the most fun, it really is," he says.